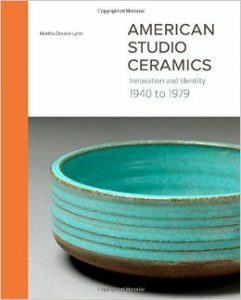 American Studio Ceramics, Innovation and Identity, 1940 to 1979 by Martha Lynn Drexler, PhD, is a much-needed comprehensive study of Studio Ceramics in the United States. In the last few years there has been increasing attention paid to art utilizing ceramic materials within the wider contemporary art world. For example, there was a strong ceramic presence in the Whitney Biennial, 2014 and at major art fairs such as Frieze Art Fair, NY, 2015.1 After decades of “craft” or “material based art” (clay, wood, fiber, metal, glass) being relegated to a lesser status, new interest by those outside the traditional craft circles makes this survey particularly timely. Perhaps with this, and other academic approaches to the subject that will follow, the ceramic arts field is a few steps closer to being accepted as part of the standard canon of modern and contemporary art history. Dr. Lynn is an independent scholar and the former Associate Curator of Twentieth-century decorative arts at the Los Angeles County Museum of Art. She spent the ten years between 1984 and 1994 at the Museum, curating several important shows about 20th Century ceramics and glass. She has written 18 books and numerous articles on the subject, including, Clay Today, 1990; Revolution in Clay, 1994; The Clay Art of Adrian Saxe, 1993; American Studio Glass 1960-1990, 2004; Masters of Contemporary Glass, 1997; Anne Scott Plummer, 1989; The Vase and Beyond, 2010. Lynn begins with a thorough examination of what the book set out to achieve, and why it was necessary. “No previous work has taken a national perspective, explored the broader social trends, or clearly connected the flow of events that formed the movement.”(1) This bold statement on the first page is largely true and indicates the importance this kind of book can make on the study of the history of the field. Having taught History of Modern Craft for ten years to university students pursuing craft fields, the impact of a comprehensive source for a student of the material, whether it is a student of the arts or of the history of the field, cannot be overstated. The dearth of truly academic art historical scholarship of the craft media in the arts is a major reason the field still struggles with an unjust reputation of being a lesser art. The lack of textbooks addressing media based or craft arts has meant that these fields have been left out of mainstream histories of art. Scholars within the field understand that all the arts are inter-connected, but without including these discussions in textual formats that are easily accessible to students of general art history, the lack of awareness continues. In the Preface Dr. Lynn discusses the issues of writing a book like this, which is largely without precedent. She enumerates her sources, which include contemporary magazine articles, first person interview transcripts, and previous histories. Thousands of artists between 1940 and 1979 worked with ceramic materials, this fact together with the lack of strong sources for information on the subject continues to impede the subject’s study. Rather than be stymied by the certainty of omitting some deserving artists, Lynn moved forward and provides a strong base for the continuation of study of the field. When facing such a sprawling and understudied field it is commendable that the author takes time in her preface to describe her format, presenting a chronological and thematic approach across eight subsequent chapters that follow the evolution of the ceramic arts from 1940-79. Lynn precedes her study of 1940-79 with an introduction and two chapters that provide pre-1940 context. These are “The Nature of American Studio Ceramics: Useful Tensions and Characteristics” and “Setting the Stage: American Studio Ceramics before 1940.” The latter outlines events in the 1930’s that set the stage for “American Studio Ceramics [to] Blossom,” the title of chapter four. Chapters four through seven present four critical decades of development, from 1940-1979. The last chapter is a short overview of “American Studio Ceramics into the Early 1980’s.” The excellent appendices cover an extensive list of makers and supporters, institutional chronologies, notes, bibliography and index. Indeed, the 17-page bibliography is a valuable resource for any art historian attempting to address the field of craft art history. In addition to excellent accounts of artists, institutions, and events, Lynn provides insightful examinations of the motivations behind this wide-ranging field. In chapter two, “Useful Tensions and Characteristics,” she cites the dichotomous US post-war mentality that valued individualism of expression, newness, and a desire for a better future world, while also yearning for a simple life represented by a romanticized idea of the past, traditionalism, and nationalism. These opposing forces were all addressed within the ceramic arts, where you could learn traditional skills while also creating new, unique works of contemporary art. Lynn goes on to suggest that Studio Ceramics cannot strictly be considered a movement. She writes: “There is no uniformity of vision or theoretical discourse within studio clay as relating to artistic goals or usage of technologies.” (21) I would argue that it is the nuanced connections within the use of clay itself that could be deemed both an artistic goal and a use of technology (in a broad sense). Lynn’s own organizational structure and highly perceptive comments on the topic can be cited as supporting material for this conclusion. In chapter three, Lynn begins her discussion of precedents for the field with the Depression and the Federal Art Project of the Works Progress Administration. It could be argued that a general survey like this might have begun with the Arts and Crafts Movement, which in the US lingered into the early 1930’s at least; but one must choose a starting point or risk never beginning. She writes that the WPA, “by placing craftsmen on par with painters and sculptors… lent respect to crafts generally and ceramics specifically.” (38) This boost in status sent ripples that had a long effect on the field, but did not entirely erase traditional hierarchies among the arts. The action lent credence both to regional potters whose work was grounded in tradition, and ceramic artists looking to industry who would become known as “designer-craftsmen.” This is one of the first “useful tensions” Lynn outlines in her text, described as “the design object versus the handmade” (25). These tensions did animate many of the artists’ work, and that revolutionary work did gain attention from the larger art world, but ceramic artists remained ghettoized. Lynn’s description of the “two streams” clearly privileges the latter stream. This higher regard gives the book a general bias toward that group as the true practitioners of the field. This is not a major problem, just something to be aware of as a reader. Seven broad themes create the groundwork for Lynn’s decade-by-decade descriptions in chapters four through seven. They are: the American post-war milieu; the clay lifestyle; hobbyists, designers, and rural potters (I would call them traditionalists as they did not all reside in rural areas); the institutional impact of the WPA, GI Bill, ACC, NEA, NCECA, and the Potters Council; international exchange; regionalism; and new technologies. These middle chapters of the book are called out by dictionary-style tabs carved into the pages, emphasizing the important developments of each decade between 1940 and 1979.2 The chapter on the 1940’s focuses on events during and directly after World War II. The war experience for many included both the brutality of war and an exposure to world cultures. Thanks to the initiative of Aileen Osborn Webb and others, many soldiers were taught handicrafts during rest periods. After the war, these factors combined with the GI Bill, led to a large increase in the demand for craft art courses at the university level. The expansion continued at a steady pace, creating teaching jobs for craft artists for the next forty years. The organizational support system of the ACC, NCECA, and others, bolstered the burgeoning field. The influence of world cultures that piqued during the war continued as Shōji Hamada, Yanagi Sōetsu, and Bernard Leach travelled the country explaining the Mingei philosophy, which emphasized the Japanese fold traditions and was partially inspired by the British Arts and Crafts Movement. The chapter on the 1950’s begins with a description of post-war American superiority and “the beginning of an American age in the arts,” where ceramics led a craft revival stimulated by a need for “personal expression.” (103) The increased interest artists had in craft media was supported by the opening of the Museum of Contemporary Craft directly across the street from the Museum of Modern Art in New York. This adjacency was intentional and achieved the desired notice of MoMA and others. Institutional support, technological advances in ceramics and glaze technologies (based on wartime scientific research), and the growing number and size of university programs created a fertile ground for the ceramics art field to expand exponentially. Functional work continued while experimentation and abstraction blossomed as well. Parallel to, and connected with the counter-culture movements of the 1960’s, the “ceramic lifestyle” presented an alternative to the standard banality of suburban life that ruled the 1950’s. Buying handmade pottery allowed a consumer to make a statement about individuality and reject, at least for a moment, the mass produced objects and images presented by growing U.S. corporate culture. Making ceramics also provided a source of income outside of the mainstream corporate culture. This chapter presents a nuanced explanation of the enticement of freedom achievable through the ceramic lifestyle. Lynn’s main interest in the 1960’s is in explaining the important transition within the field in that decade, represented best by Peter Voulkos and his literal breaking of the vessel form to achieve expressive sculptural forms, rather than functional objects. This change had begun in the ‘50’s but was explored in the writings of Rose Slivka, editor of Craft Horizons, the ACC’s journal. Voulkos and his students and acolytes were on one side of a schism that caused friction with potters, but this tension also pushed both sides to greater heights. The 1970’s brought a continued discussion of the break between functional and sculptural works, the development of the ceramic lifestyle as an alternative to the mainstream, and an increased attention to feminist and other current political issues. Lynn also addresses the different approaches to the medium adopted in diverse areas of the country, although Philadelphia and the mid-Atlantic region get short shrift. Lynn begins her final chapter, “American Studio Ceramics into the 1980s,” by writing: “between 1940 and 1980 studio ceramics moved from being a desirable embellishments for middle-class domestic interiors to works presented on pedestals in museums.” (329) From the perspective that craft arts should be subsumed into the world of contemporary art and viewed alongside the popular art movements of the time, this statement indicates that this goal was accomplished in the early 1980’s. This thesis pays the majority of its attention to ceramic artists on the West Coast (as does much of the text), who valued breaking boundaries and desired acceptance from the contemporary art world. One narrative that receives less attention in the text is the lingering importance of the Arts and Crafts Movement and Colonial Revival on the development of American ceramic art. Both movements established the idea that craft art should be valued equally to other arts, but that it also bears a distinction that should be sustained. What still remains to be seen is an equal value placed upon a beautiful functional object that can bring joy to the life of the user, versus a purely sculptural object intended for museum or gallery display. Artists on the East Coast were more focused on finding a balance between these two poles than their West Coast colleagues. While their work was more traditional and quieter, it is no less integral to the field. Cited in this review are a few aspects of this rich text that gave me pause, but it is its ability to provoke serious contemplation that is one of its many valuable attributes. The book covers more than sixty years of activity of a wide-ranging group of artists unified by their material. Lynn includes many obscure artists who should be part of the canon, and this text will add to the remedy there. It was a joy to read the information scholars in the field have gleaned and gathered from many sources within the covers of one excellently written, illustrated, and designed book. Scholars of American Art should read the book to familiarize themselves with an important group of American artists who have been largely left out of the general canon of art history. Craft historians and craft artists will also benefit greatly from this insightful text, adding to the growing scholarship and self-awareness of this rich artistic field of pursuit. About the Author(s): Jennifer A. Zwilling is Curator of Artistic Programs at The Clay Studio, Philadelphia.